I recently received an email suggesting to adding features to aircrack-ng. Even though most of the stuff can be found in the documentation, it might be worth talking about. Aircrack-ng can read words from a pipe, which is very convenient and you can use pretty much any program to generate words and display them on the screen (each line will be considered a word) and pass them to aircrack-ng. About compressed files, there are tools to decompress files on the fly and display the output on the screen such as zcat who takes care of gzip compressed files (there are others and most compression/decompression tools have a feature to display decompressed output to the screen). In this example, it decompress file.gz and 'cat' the result to the screen, then we pipe it to aircrack-ng. Aircrack-ng reads wordlists files using -w and in order to tell it to get it from a pipe (to be technical, stdout from the previous command became stdin in aircrack-ng), you have to use the '-' as parameter for -w.
airolib-ng can generate tables (in SQLite format) or import them from cowpatty's format. Once the table is generated, use -r in aircrack-ng to read them (instead of a wordlist). There is a tool in the script/ directory to do that called dcrack.py. As a matter of fact, check out that entire directory, there are a few useful scripts in there. 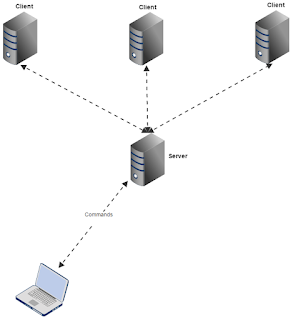 The different clients represent the cracking systems, the server coordinates everything based on the performance of each client. Each client joining the server will have its performance assessed and when a wordlist is uploaded, it will be split according to each client's performance so they all take the same amount of time to process the dictionary. The laptop (you) send commands to the server to upload dictionary, to upload capture files, to start the cracking process and obtain the status of the cracking process (as well as the key). When uploading a PCAP file, it is highly recommended to clean it up and just leave a beacon as well as the 4 EAPoL packets (or less if you have less) of the 4-way handshake or you'll risk aircrack-ng choosing the wrong packets when cracking. There is a tutorial about it in the wiki.